from Phil Green: Wow, what a brilliant book!…Congratulations once again on a truly remarkable achievement. from Peter Warm: This book moved me. I think the ideas in this book are ahead of our time, and for me they join up several areas of interest such as handling conflict, communications, philosophy, and generally how to move towards feeling in tune with the planet, despite the daily crisis we see in the media. I particularly liked the section on the growth of life on our planet, an area I had little knowledge of before. This gave a wonderful context for the following ideas and discussions. I laughed because from my own work in conflict resolution I see that the first step must be to de stress the situation, to ensure that both sides know they will get the time to be heard and understood. Here I was, feeling just this happening to me reading a book about what were doing on this planet. Fantastic. from Sandrine Simon: Above all, this refreshing book is generous and full of hopes. A long awaited cure in communal visionary and practical thinking that will inspire us in moving towards ‘real sustainability’. from Peter Bradbury: This is a thought-provoking book that pinpoints many of our major concerns about the destruction of the natural environment and the now commonly accepted decline of personal and community relationships. …Alexander has a welcome sense of humour which relieves the seriousness of his message – there are many lively and humorous cartoons throughout the book. from John Monk: This book is a manifesto for a new world order, disarmingly presented and written. …Aside from the well crafted English that studiously avoids specialist language, the sparingly sprinkled, inoffensively humorous cartoons, the uncomplicated diagrams, the fragments of dialogue between the author and the reader that seem to pre-empt the reader’s objections and the frank autobiographical notes that transform the author from being a distant authority into a vulnerable, well-informed friend, aside from these editorial tactics the text achieves its effects through an interwoven Utopian narrative and brief, romanticised anthropological studies. …my reactions to the book helped me to formulate more clearly the way in which I would like the world to be. from Bob Zimmer: Overall, I like the book a lot. I see it as a message of practical hope. from Russell at Afribike: Just to thank you for the book, it is currently one of my best readings. I am not yet through with the book but I am enjoying your style of writing and the issues you are raising. Here’s a nice review of eGaia on the P2P Foundation blog, dated 13th August, 2006. If we were all to wake up one morning to discover that poverty, war and injustice had miraculously been abolished and we found ourselves living in a peaceful, sustainable world, what would it look like? And how might we get there? Gary Alexander in eGaia aims to answer both questions. The book’s title is derived from James Lovelock’s concept of the earth as a self-regulating system, Gaia. Alexander’s ‘e’ prefix denotes electronic communication, through which he believes the earth, including humanity, is now beginning to evolve beyond an ecosystem, inter-connected but unaware of itself, to an increasingly self-conscious and coherent organism. 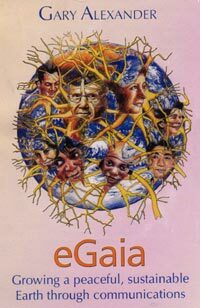 eGaia’s gloomy starting point is that humanity has become a global cancer, plundering the natural world, at war within itself, and driven by a competitive, growth-obsessed money system that has become our master rather than our servant. But it doesn’t have to be that way. In his “5 Billion Year Story” chapter, Alexander meticulously describes how symbiosis and co-operation have been, and should continue to be, at least as important as competition in driving the evolution of life on earth and the further development of human civilisation. He then describes a set of “eGaian principles” that could guide 21st century humanity as it begins to transform itself into a peaceful, co-operative species. Conflict resolution techniques would be taught to everyone, enabling disagreements to be nipped in the bud before they escalate to damaging proportions. Peace, sustainability and human well-being would replace profit and competition as the driving forces of human society. Like William Morris in News from Nowhere, Alexander paints an unashamedly-Utopian picture of what life could be like in a future eGaian society. He describes the lives of various young, middle-aged and old members of the “Pinecone Network”, a co-operative economic and social grouping of several hundred people in and around a provincial town. There are many such networks, all loosely linked, at local, national and international levels. Together, they constitute a sustainable, co-operative economy made possible by computer-based networks and software specifically designed to facilitate co-operation, sustainability and conflict resolution. Such technological aids should enable a future co-operative economy to overcome one major problem of earlier eras: the sheer number of hours required for decision-making in meetings. As Oscar Wilde once remarked, socialism is a wonderful ideal, but it would take up an awful lot of evenings…. The main strength of eGaia is that it concentrates on the positive: what kind of society do we really want, and how might we get it? The pictures of an eGaian future that Alexander paints are attractive. They may seem Utopian at present, but many similar ideas that were considered Utopian in the past are realistic today. The means by which he suggests we progress towards an eGaian society seem plausible, socially and technologically. And he suggests a number of ways in which we could start to build an eGaian society today. But Alexander, like many Utopian authors, appears to underestimate the resistance to change that would be exerted by those who benefit most from the present economic and social system. One doesn’t have to be a Marxist to observe that the richer and more powerful members of society tend to promote policies that will maintain their dominant positions. Their interest often conflict with policies that would be in the interests of the majority. So a determined coalition of countervailing forces — such as environmental and social pressure groups, trades unions and NGOs like the anti-globalisation movement — will need to be mustered to ensure that the interests of the privileged minority do not prevent the development of a sustainable, co-operative economy that would ultimately benefit everyone. Nevertheless, this is an excellent and thought-provoking book. It was produced in a preliminary edition by a small publisher for the 2002 Johannesburg Earth Summit and has already had a favourable reception in specialised circles. What eGaia really needs now is a new, updated edition, including a stylistic ‘makover’, by a mainstream publisher with the resources to enable its important arguments to gain the wider attention they deserve. Review by Sandrine Simon, Open University, Faculty of Technology, Centre for Complexity and Change, Systems. Walton hall, Milton Keynes, MK7 6AA, UK. The World community of people dedicated to environmental issues has been advocating not only envisioning what a sustainable world could be like but also working at identifying practical ways to get there. Many of us also got pretty good at criticising what is wrong with the ways in which we are currently managing the human-ecological systems interactions. To some extent, Gary Alexander, author of this new book, doesn’t deprive himself from releasing a good dose of outrage concerning the way in which we base our economies on a monetary system that he describes as ‘institutional mistrust’. But what might be even more interesting to the reader are the systemic and interdisciplinary approaches that he adopts to describe what he calls ‘the global cancer’ we have created for ourselves. improving human skills of communication and relationships. The author, one of the first Open University lecturers to start developing interactive, collaborative distance online learning courses, uses his fantastic OU skills to engage his readers in an interactive learning journey, a dialogue, interspersed with humoristic illustrations. If you have doubts about what the book suggests, Gary will soon interject to reflect on this and will initiate an exchange of views with an imaginary member of his audience. This is an inspiring way of getting students – and so many others! – to critically think about how to put sustainability into practice: lecturers will be delighted to go through such animated and pertinent debates. But this book is also addressed to all types of other people, those who would like to see some major new changes (neither a return to some mythical ancient golden age nor business as usual) and to investigate some possible futures. how systemic views, conversations and communication can be at the root of environmental solutions. Examples of how these principles might be implemented are given through suggestions of imaginary (yet possible) communities of the future. The story of life and its evolution is then given in Part 2. Throughout this part, the author stresses the fact that with the rise of the competitive market economy, and later with the Darwinian theory of evolution, the competitive side of the story of life came to be emphasised out of proportion to its contribution. He helps us in understanding the complementarity between competition and symbiosis and highlights the fact that life is about symbiosis and inter-connections, hence networks. In part 3, we then concentrates on ‘high level’ principles for sustainability and the author focuses on regeneration and recycling, stability, resilience and self repair, as well as adaptability and creativity. He investigates these through the issues of land use, making things sustainably and sustainable energy uses, as well as conflict resolution. a symbiosis among the parts so that they can aid each other and the whole rather than being in conflict. Many of the practical illustrative examples given focus on co-operative networks – a favourite of the author, since ‘a co-operative economy can produce a synergy where the result is greater than the sum of people’s effort and since this produces the qualities of a group functioning as an organism, which is the fundamental eGaian image’. A computer network is central to the co-operative economy described by Alexander, since it provides an infrastructure, a platform, to make thinks easier and engage people who live separate, dispersed lives and helps them co-ordinate their activities. Unsurprisingly then, the book finishes with the Johannesburg WSSD, the ‘first summit of the Internet age’, which opened the possibilities of groups of people around the world to co-ordinate their actions locally and globally. Alexander provides examples of such networks through web portals (such as Global Green Information Networks, fair trade networks, education for sustainability, or global emergency aid and development funds). Above all, this refreshing book is generous and full of hopes. A long awaited cure in communal visionary and practical thinking that will inspire us in moving towards ‘real sustainability’. ‘A Utopian piece of fiction, told by an ageing hippy’ is how Gary Alexander anticipates his readers might view this book. To some extent, they would be right, but if we dig a little deeper, there is more to this book that just might change the world. The name ‘eGaia’ prefixes Lovelock’s holistic Earth system with an ultra-modern ‘e’ signifying electronic communications. The book adopts a radical and challenging approach to what Alexander terms our ‘global cancer’: biodiversity and habitat loss, war, climate change, poverty and social disintegration. The solution is to view humanity as a ‘global nervous system’, and incorporate three key principles: peace (founded on clear, coherent communications), sustainability (reducing humanity’s impact on the environment), and the right goals (well-being, rather than profit). Alexander’s thesis is based upon an understanding of relationships – starting with the way we understand ourselves, and from this moving on to how we understand each other and learn to live together, through conversation and reflection. Alexander’s work has developed over almost 30 years through his work at the Open University, and his interest in developing successful communication systems – the tools for healthy relationships – was married with a passion for envisioning and creating deep green sustainable communities. Part two of the book tells ‘The Five-Billion Year Story’ of the evolution of life on earth, from the emergence of amoeba through the development of language and anthropological studies of early tribes, explaining how symbiosis has been as important to the development of life as competition, and how many human societies were founded upon principles of co-operation and collaboration. 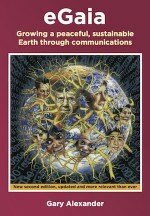 The third part of the book presents an eGaian alternative, setting out principles of successful relationships and conflict resolution embedded within nourishing social structures, a co-operative economy, and practical methods to reduce consumption and energy use to build an environmentally sustainable society. This book is not all theory, however, and depending on your temperament, some of the more personable elements of the text will either bring alive the storytelling and ideas, or simply irritate. For example, one chapter gives a taste of an eGaian future, and describes life in the utopian Pinecone Network community, where Alexander presents several ‘life in the day of’ characters, following them on their chores at the farm, to their co-operative workplace, spending their local currency, and driving community-owned minibuses. Another quirk of writing style is the use of ‘You’ and ‘Me’ dialogue between reader and author – an attempt to anticipate and respond to reader criticism perhaps, or to overcome the one-way communication that a book represents. It will be clear by now that this is no ordinary academic treatise on the environment and society. It is a deeply personal text, enlivened with illustrations and cartoons, and written in a very clear, accessible style. This perhaps represents Alexander’s true aim, which is to break out of academic libraries and into a wider public and policy domain, and in particular to inspire and work with community groups across the globe in putting these ideas into practice. It will appeal to anyone studying environmental politics as well as practitioners of community initiatives for sustainability, and may even bring a breath of fresh air into the classroom. For while this is not written as a textbook, the referenced sources provide rich pickings for anyone wishing to follow up on the ideas proposed.With this in mind, two areas that could usefully be improved in future editions are the provision of an index, and a resource list. Given the urge to act which eGaia aims to inspire, it is appropriate that this edition is dedicated to the thousands of people who attended the 2002 Johannesburg World Summit on Sustainable Development, where eGaia was launched. Alexander describes these people as ‘my allies and the best hope in a generation of making a difference towards the visions in this book’. eGaia is an unusual book. It is a personal statement of hopeful vision, a call to arms for a sustainable future, a potted history of life on Earth and a living example of the communications principles it proposes. The book is available online, to order or download or to discuss with the author.